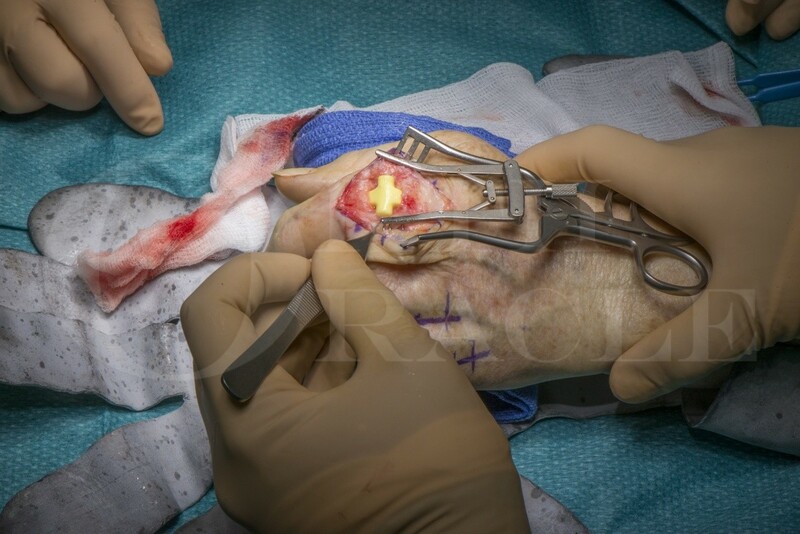 Learn the Swansons’ MCP Joint replacement surgical technique with step by step instructions on OrthOracle. Our e-learning platform contains high resolution images and a certified CME of the Swansons’ MCP Joint replacement surgical procedure. Swanson’s joint replacement was described in the mid-1960s. The silicone-rubber implant was designed to improve the alignment of the fingers by active as an internal splint and stimulate a pseudo capsule formation. Swanson termed this implant a ‘load-bearing flexible hinge’. This is still the most commonly performed prosthetic arthroplasty for rheumatoid arthritis. There are three major designs of the implant available. The original Swanson design (Wright Medical), the Small Joint Innovations flexible implant and NeuFlex (DePuy). Institution: Birmingham Hand Centre, Queen Elizabeth Hospital, Birmingham, UK.